I've got an urgent announcement for you today. No, this has nothing to do with Trump's State of the Union Address last night. In fact, this cash isn't tied to Washington at all! (Except for the fact that much of this cash was freed up because of legislation passed in late 2017). This cash is real U.S. currency, being transferred to real citizens like you and me. In fact, you can tap into these cash payments even if you're not a U.S. citizen and even if you're not living in the states! So I'm hoping that today, you'll pay close attention to this alert and make sure you position yourself to claim your portion of this monumental amount of cash being distributed this year. It's currently sitting squarely in the bank accounts of corporations across America. But it's not going to stay there. Because shareholders are increasingly demanding that companies return this cash to its rightful owners. The investors in each individual company. And long-term investors benefit because they own a larger piece of the company, and thus a larger portion of the company's profits. Don't forget that when a company buys back shares, dividends are still paid to investors. Only now, there are fewer shares over which a company must divide its cash set aside for dividends. So in this environment, dividends naturally increase, giving you even more income! I'm excited about the $940 billion in buybacks and the hundreds of billions to be spent on dividends as well! With shares trending lower in the fourth quarter, we've got an excellent opportunity to buy the stock at a discount. Meanwhile, the company's own buyback program will be more effective as Apple can now retire more shares for every billion dollars in cash spent. 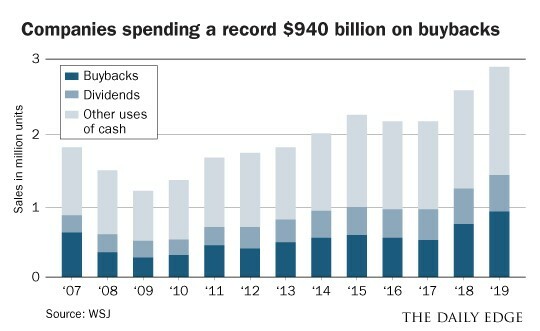 Apple, and plenty of other cash-rich corporations are giving you an excellent opportunity to collect from the $940 billion in buybacks this year. But don't wait until this cash is spent before you tap into this opportunity!